Hilda Lyon, ARAeS (31 May 1896 – 2 December 1946) was a British engineer who invented the "Lyon Shape", a streamlined design used for airships and submarines. Lyon was born in 1896 in Market Weighton, Yorkshire. She was the youngest daughter of Thomas and Margaret Lyon, her father was a grocer. Hilda Lyon attended Beverley High School and then in 1915 went to Newnham College, Cambridge, from which she obtained a BA in mathematics. After graduating, Lyon took an Air Ministry course in aeroplane stress-analysis and then obtained a job as a technical assistant. She saw no prospect of promotion or more responsibility "for a woman mathematician" in this job, so she and her sister quit their jobs and went to Switzerland for six weeks. In 1918, Lyon worked as an Aircraft Technical Assistant for Siddeley-Deasy. She moved to George Parnall & Co. in 1920. Around 1922, Lyon was admitted as an Associate Fellow of the Royal Aeronautical Society. 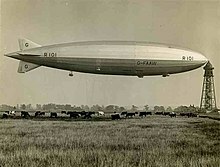 From 1925 onwards, she was a member of technical staff at the Royal Airship Works in Cardington, helping to develop the R101 rigid airship through her work on aerodynamics. In 1930, Lyon was awarded the R38 Memorial Prize by the Royal Aeronautical Society for her paper "The Strength of Transverse Frames of Rigid Airships". It was the first time that any prize of the society had been won by a woman. Lyon's work involved travel to America, Canada, and Germany. In 1930 she went to America on a Mary Ewart Travelling Scholarship and took up studies at Massachusetts Institute of Technology, where she was first permitted to use a wind tunnel. In 1932, she submitted a thesis on "The Effect of Turbulence on the Drag of Airship Models" to obtain her MA. After submitting her thesis, Lyon went to Göttingen in Germany, and conducted research at the Kaiser Wilhelm Gesellschaft für Strömungsforschung with Ludwig Prandtl. After her return to Britain, Lyon spent time at home as a carer, keeping up with her research at the same time by using the libraries of the University of Hull and the University of Leeds and by visiting the National Physical Laboratory and the Royal Aircraft Establishment. During this time, she worked on aeroelastic flutter and elastic blades. From 1937, Lyon returned to full-time aerodynamic research as a Principal Scientific Officer at the Royal Aircraft Establishment in Farnborough. She first worked in wind tunnels on boundary layer suction, then joined the Stability Section. She later became head of this section, and also served on the Aeronautical Research Council. Lyon died on 2 December 1946 following an operation. After her death, her research and the "Lyon Shape" which she devised were incorporated into the American submarine USS Albacore, which had the prototype streamlined hull form for almost all subsequent US submarines. ^ a b c d WISE. "Inspiration | Women in Aviation, the female inventor of the 'Lyon Shape'". www.wisecampaign.org.uk. Retrieved 2017-06-15. ^ "Deaths". The Times. 4 December 1946. p. 1. ^ a b c d Bradfield, J. B. (1946). "Hilda Lyon". The Woman Engineer. VI (8): 122 – via IET. ^ a b c d Lyon, Hilda (1944). "Adventures in Aeronautical Design and Research". The Woman Engineer. V (19): 291–295 – via IET. ^ a b "R 38 Memorial Prize". Official Appointments and Notices. The Times. 27 February 1930. p. 11. ^ "New Members". The Woman Engineer. III (3): 33. June 1930 – via IET. ^ Lyon, Hilda (20 January 1932). The Effect of Turbulence on the Drag of Airship Models (PDF) (Thesis). Retrieved 15 June 2017. ^ "Miss H. M. Lyon". Obituaries. The Times. 9 December 1946. p. 7. ^ Polmar, Norman; Moore, Kenneth J. (2004). Cold War Submarines: The Design and Construction of U.S. and Soviet Submarines. Potomac Books, Inc. ISBN 9781597973199. This page was last edited on 7 July 2018, at 13:09 (UTC).